Are you 11 to 18 years old? Do you want to perform in a rural theatre like no other? 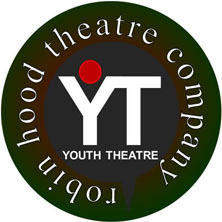 Then the Robin Hood Youth Theatre is the place for you! A full length production as part of the RHTC programme. Other smaller productions to showcase the work of the youth group throughout the season. Workshops in all aspects of performance with opportunities to learn stage management and other technical skills. Sessions are held at the theatre every Sunday, during term time, from 4.00 to 6.00 p.m.
at a cost of £6.00 per week payable half-termly in advance.